This should be a surprise to anyone. 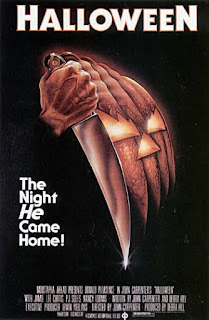 Halloween has been a film I've watched every single Halloween since the sixth grade. It has become tradition to the point that even if I don't watch many horror movies throughout October, I still make time to sit down and watch this at the end of the month. It's funny how it's evolved too. The first time I started the tradition was with a copy that I had taped off of FX because I wasn't old enough to watch the film uncut. I watched that tape several times till I finally was able to upgrade. I'll be upgrading to the Blu-Ray soon enough, so maybe next year I'll get to see this movie in the best quality possible. As for the movie, it amazes me every time I watch it. It is easily one of my favorites of all time and it never gets old. I notice new things every time I watch it. And the more and more I'm exposed to things behind the camera, the more I appreciate this movie. The tracking shots, the perfectly lit night shots, it all adds up to a film that goes above and beyond the standard of modern horror movies. And this concludes my series 31 Days of Horror. Thank you muchly for reading and check out the site tomorrow because I'll be announcing another series that I think you'll rather enjoy. So I guess I'm just trying to say...I'll be back.